Most people think writing for beauty and fashion publications is all about glamorous events and free product samples. Well, that is part of it, but being a beauty and fashion writer is also a lot of work. Janene Mascarella (@MrsWrite), beauty director of BELLA New York, oversees the luxury magazine’s Beauty Scene section. She writes and assigns about 10 splashy pages in each issue, featuring the latest beauty tricks, tips and trends. She has also been published as a freelancer in various publications, including Washington Post, Newsday, CNNMoney.com, Cosmopolitan, Self, Glamour, Health, Cooking Light, Women’s Health, USA Today, Scholastic Parent & Child, Woman’s Day, Parenting, Parents, Family Circle, Babytalk, American Baby, Weight Watchers, Arthritis Today, Working Mother, Fodor’s Travel, AOL Travel, CBS News, Hamptons Magazine, AARP Bulletin, American Way, Chase.com and many others. She is also a weekly columnist of Parade Magazine’s Community Table. 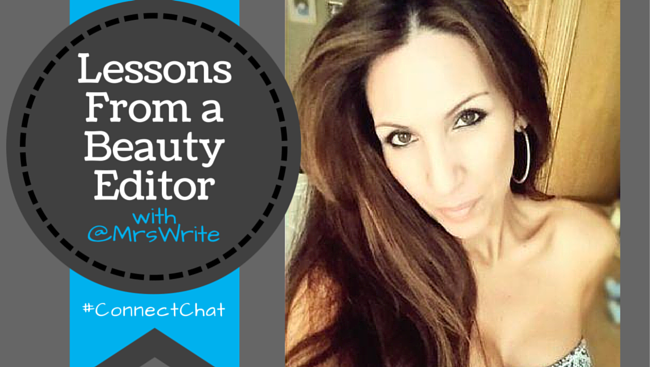 She recently shared her insight with me on beauty and fashion magazines and how you can break into writing for them. Tell us a little bit about what you do for BELLA New York? What’s a typical day like? I’m always working on something fun for BELLA. It’s such a fabulous publication. It’s really my dream job! I handle the Beauty Scene section and a two-page home décor feature called “Sophisticated Spaces.” I do get a crazy amount of pitches/products/press releases. Staying organized can be a challenge. And it may be 90 degrees out here in New York, but right now I’m working on holiday gift guides! It’s so important for people to remember magazine lead times. Yes, we’re already done with the fall issues! Some people think beauty and fashion writing is all about attending parties. There are lots of events and parties – more than I could possibly attend – but there’s so much non-glam work involved too. It’s really great to get up from my computer chair and network. BELLA is having a big celebrity White Party in the Hamptons this month. I’m excited to get dressed up and mix and mingle. What is something writers might not realize about writing for the beauty and fashion industry? When writing beauty and fashion copy, you want to strike a balance of being informative, entertaining, relevant and useful to readers. Useful is key. We try not to make readers feel like they need that $50 eye cream to be beautiful. There are just so many products and brands out there. I really do try and test so much. Do you deal only with experienced beauty writers, or would you take a pitch from someone new to the industry? For the print version, it’s not a beginner’s market. Experience is important, as is having the contacts in the industry. But I got an assignment for a national magazine my first time pitching – not a clip or a clue. I just never mentioned it. I had an idea and followed through with confidence. So I say swing for the fences! In general, what do beauty industry editors look for from freelancers? What catches my eye: clever packaging; delivering the info in a fun way; a smart way to frame the topic; a catchy headline. Don’t just give me a list of products. Also, knowing and nailing the magazine’s voice is so important. Pitch the magazines you love to read. And being nice and easy to work with is everything. What is a big no-no for a writer pitching a beauty/fashion story? What we were just talking about – not knowing the magazine’s tone or demographic. Some are obvious that they never even read the magazines, with pitches far off in left field. Also, don’t address the pitch as “Dear editor.” I don’t like that. What kinds of things do you look for when being pitched by a writer? First, be fun. Beauty and fashion should be fun! Magazine writing should be chatty and conversational. Lots of folks miss that! Also, connections and contacts in the industry. There is just no time for handholding. Print works many months in advance. You need to pick up on trends before they emerge, so having fashion and beauty PR contacts is a must. Is it more important to have a background in beauty/fashion industry (even if not as a writer) or as a writer in another industry? It’s extremely helpful but if you’re passionate about it, you have to start somewhere. Immerse yourself in the industry, pay attention, network. No background? Start building one! Do you have to live in a major city, like New York? I don’t think so at all. I never was asked where I live until they needed to send the check. How can freelancers find out the best person to pitch in a particular industry/publication? This is a no-brainer: call! In the age of email, a phone call is most welcomed (and noticed) at many pubs. Ask nicely, and chances are you’ll get someone friendly and chatty and willing to help you. What are some of the hottest topics in the beauty and fashion industry right now? DIY/at-home spa and salon treatments are very popular. Also, there are a lot of high-tech devices to beautify – lasers, microdermabrasion, etc. – but they can be costly and not all deliver as promised. I happen to love the “beauty subscription box” trend. It’s a fun way to try and discover new things, delivered to your door. There are also lots of great apps that are like the Uber of beauty. You can book an at-home manicure, airbrush tan, facial, even a massage. I actually tried the at-home massage service and it was amazing. I LOVE MY JOB! Any last words of advice to aspiring beauty and fashion writers? I hear this all the time: “I started a beauty blog and am waiting for editors to notice me.” Editors are super-busy and probably not scouring the Internet for new talent. Stay dedicated to that beauty blog, but don’t just wait around. Find a magazine you love and read, and start pitching ideas. Don’t wait hoping something big will happen. Go out and make it happen. Pitch something only you can write – an essay, perhaps – something funny or relatable. If you truly have your heart set on beauty and fashion writing and you believe in yourself, it will show – and pay off. Whether you’re a reporter, blogger, freelancer or author, ProfNet can help with your search for sources. Just submit a query telling us what you’re looking for, your deadline, and how you want to be contacted, and we’ll send it to the appropriate experts in our network.Send a query to get started. August 27, 2015 in Journalists and Journalism, Media Q&As. That is so informative and to the point. To know about latest designs of clothes trend check out my website http://www.shenannz.com/ hope you’d like it.